Over 70 IMS Global member districts and state departments of education (and growing)—representing more than 11 million students—are leading efforts to enable an open digital ecosystem to support personalized learning for more than 10 million students in K-12. IMS Global members collaboratively guide, develop, and adopt a trusted, plug-and-play ecosystem of digital learning products that work seamlessly together, are less expensive to integrate, offer greater choice and flexibility to enable classroom innovation, and provide better analytics and insights to improve student success. View all IMS Global members—a growing collaboration of over 450 school districts, states, higher education institutions, and leading software suppliers. Developed under the guidance and leadership of IMS Global K-12 members, this strategic program empowers school districts of all sizes and needs to evolve their digital ecosystem for a better return on learning from investments in educational technology. This multi-faceted program starts with the commitment to IMS certified products then as a district is ready to implement more revolutionary approaches to teaching and learning, the other parts of the program provide guidance and resources. Each part is customized to meet the needs of the district or institution. Learn more about the K-12 Digital Learning Revolution Program and discover how your district can achieve a plug-and-play digital ecosystem that supports your strategic and operational goals. 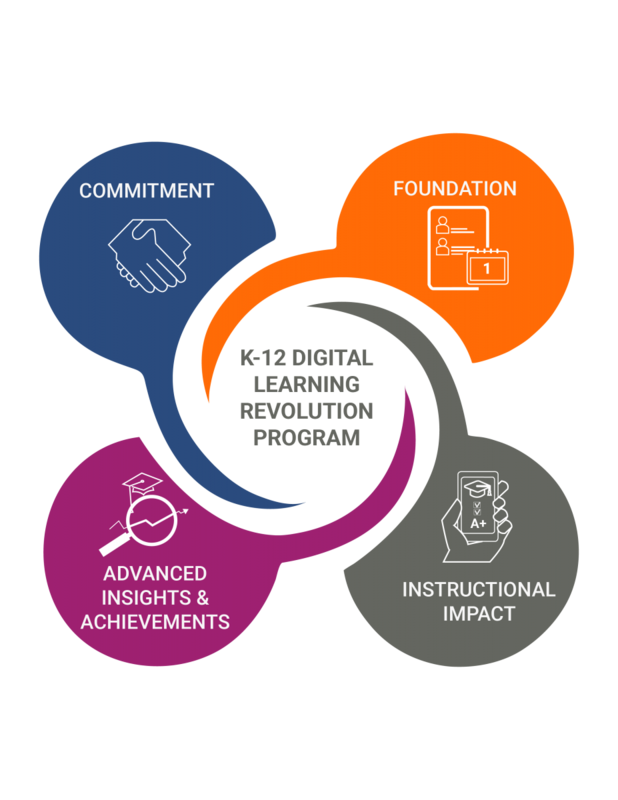 Districts who want to improve the usability of their educational technology should consider the IMS K-12 Digital Learning Revolution Program. Each tier is customized to the needs of a district and the program continues to evolve as a district becomes more advanced in their use of open standards. IMS Global Learning Consortium provides the support and resources to ensure successful implementation at all levels of the program. The opportunity to network with other districts is also highly beneficial. The K-12 Digital Learning Revolution Program allows districts to clearly articulate the goals of their digital ecosystem. The K-12 program clearly outlines the value proposition to vendors to have all of their products IMS certified for a wider customer market. The K-12 program provides a path for school districts to incorporate the goals of an interoperable, personalized, digital ecosystem into short-term action plans and long-term strategic planning. IMS Global has been a great partner and resource as we engage with providers and innovate in our practice. The K-12 leadership community, RFP templates, IMS certification, and the K-12 Digital Learning Revolution program have all been extremely helpful. Providing a seamless digital ecosystem for our learners and leaders is challenging but we feel that our partnership with IMS Global will help us to achieve these goals. With IMS OneRoster you can ensure all digital resources are instantly ready to use in the classroom on day one of learning. IMS standards are enabling institutions to fully leverage the benefits of digital technology now and in the future. Explore how IMS Global is helping K-12 districts advance edtech and instructional practices to support more revolutionary approaches to teaching and learning. Created by IMS Global district members, the K-12 Playbook is an easy-to-use reference and resource center for K-12 administration, digital curriculum teams, and IT leaders who are working to implement the K-12 Revolution Program. IMS Global Learning Consortium is proud to host an ongoing webinar series to share how districts are evolving toward student-centered learning based on open, plug-and-play technologies and integrated curriculum architecture. A collaboration between school districts and suppliers that will make it radically easier for school districts to make digital resources and applications available to teachers and students and go digital on day one of learning.